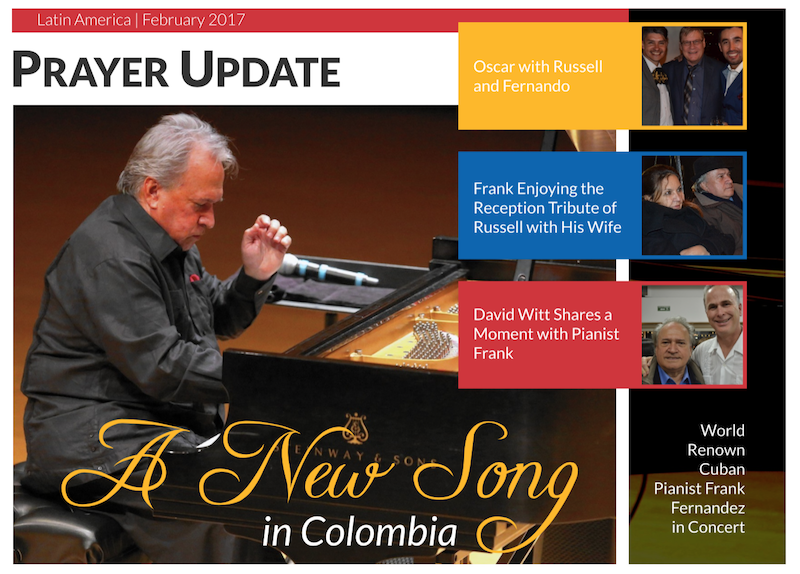 Beautiful music rang throughout the meeting hall last week as world – renowned Cuban pianist, Frank Fernandez, honored Russell with a concert on a grand piano in Bogota, Colombia. Leaders and dignitaries traveled from afar to honor Russell Stendal for his contribution of the peace process. Over three hundred people packed into a meeting room with overflow and security out the door. 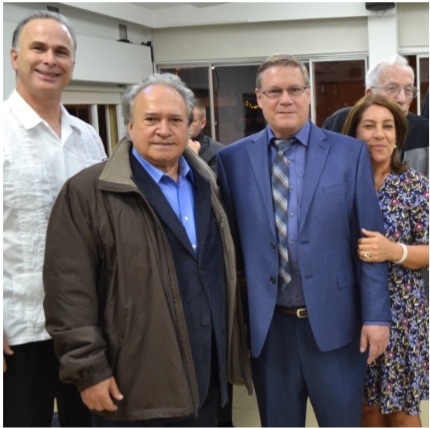 Those present included retired and active generals, a colonel from the Colombian military, and police chiefs. The VIP list continued with doctors, lawyers, ministry leaders and others. People traveled from Cuba, Canada, Finland and the United States. The media was spread throughout the room with cameras, video and electronic gadgetry. The crowd covered the spectrum of worldviews ranging from Catholics, Protestants, liberals, conservatives, converted to faith in Christ and unconverted. All had come to support Russell and to honor him in the contribution to the Colombian Peace Accord. Every person in attendance had a story and a connection with Russell and the Stendal family. Pianist, Frank Fernandez, is a Marxist leader from Cuba with great influence. Two years ago, he clearly stated, he was an atheist. Russell and Albert built a relationship with him in friendship and prayer. They found out about his troubled childhood of rejection and hurt received from his father. They pointed Frank towards the Heavenly Father as the one who heals pain and mends through forgiveness. During this season, Frank had a major concert in Havana. His ring finger cartilage was deteriorating causing problems with movement and pain. Like a surgeon’s hands, this problem could destroy his career. Albert prayed for his finger and Frank experienced healing. Albert (91 years young) traveled from the United States to attend the celebration and a couple of times during the concert, Frank held up his right ring finger and smiled as he looked at Albert. The audience was enthralled with the passion, gifting and mastery with which Frank played classical pieces of Chopin, Mozart, Bach and others. Russell commented afterwards that Frank made sounds from the piano that he did not know were possible. We all whole-heartedly agreed! Above the quality of music, was Frank’s love and appreciation for Russell. The subtlety of all this is Frank’s heart warming toward Christ’s love shown through Russell. For years, Russell has programed redemptive music along with Bible teaching into radio programs that broadcast 24/7 throughout the remote regions of Colombia. Music has power to penetrate the heart and soul. As displayed in the book of Psalms, David played his harp to calm the evil forces raging in King Saul. We read in the Old Testament that musicians led the Ark of the Covenant and the Israelites before battle. Another musician who has been touched by the radio and teaching ministry is Oscar. Oscar is featured on radio programs in Colombia on a regular basis. Over the years, he has written poetic songs that speak to the injustice of the civil war and for the hope of Colombia to turn to God. Specifically, Oscar wrote songs about Russell being a man of God on a mission of peace. During the night of celebration, a Mariachi band played Oscar’s songs to express honor and tribute to Russell. His music was a wonderful blend of high quality talent, entertainment and inspiration. A copy of the words were passed out to guests in Spanish and translated in English. Below is one song expressing how God used Russell being taken hostage many years ago.